Yardbirds by Richard KolbEach Yardbirds sculpture is created with scrap and recycled parts. Unique & whimsical, they're perfect to decorate your house inside & out. 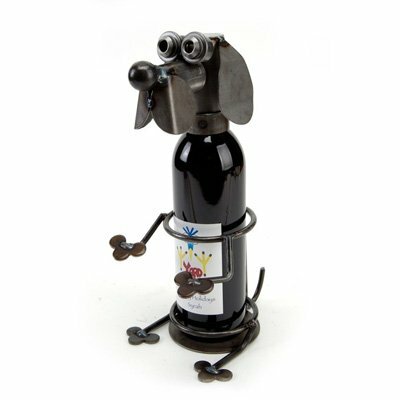 Due to the handcrafted nature of these pieces, no two are ever exactly alike.Junkyard Dogs, Cats, Birds and Sculptures are bare metal and naturally rust with age -- that's their beauty. As we say, "They rust, but they'll never run away." measures 21" x 6" x 12.5." Each Yardbirds sculpture is individually hand made out of recycled steel parts. Yardbirds recommends treating them with a clear acrylic enamel spray such as Krylon® or Rustoleum® to prevent rusting.Please note: this item will be shipped directly from the artist; no expedited shipping is available. **This is a special order item. 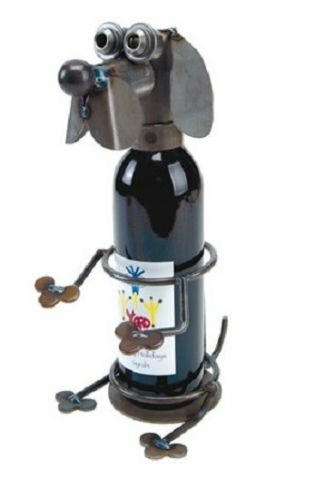 Wine Bottle Holder, Drinking Moose Bandana Yardbirds Each Yardbird Wine Bottle Holder is created with scrap and recycled parts. Unique & Whimsical they're perfect to hold a bottle of wine, and excellent to give to the person that has everything. Due to the handcrafted nature of these pieces, no two are ever exactly alike. Choose from one of our many designs. Although some designs are special order, we do stock many of them. 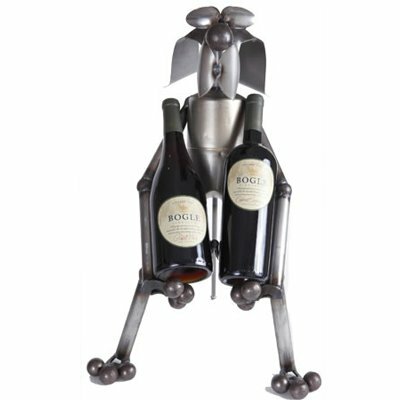 Some of our most popular ones are: Drinking Hound Wine Bottle Holder; measures ~6.5" x 5.5" x 13.2" Horse Wine Bottle Holder; measuers ~7.5" x 5.5" x 15.5" Merlot the Cat Wine Bottle Holder; measures ~6.5" x 6" x 14" Dachshund Wine Bottle Holder; measures ~6.5" x 5.5" x 13.5" German Shepherd Wine Bottle Holder; measures ~6.5" x 5.5" x 16" Terrier Wine Bottle Holder; measures ~6.5" x 5.5" x 15.5" Each Yardbirds Wine Bottle Holder is individually hand made out of recycled steel parts. All of the wineholders are bare metal and will rust with age if not treated. Yardbirds recommends treating them with a clear acrylic enamel spray such as Krylon or Rustoleum. Yardbirds by Richard KolbEach Yardbirds sculpture is created with scrap and recycled parts. Unique & whimsical, they're perfect to decorate your house inside & out. Due to the handcrafted nature of these pieces, no two are ever exactly alike. 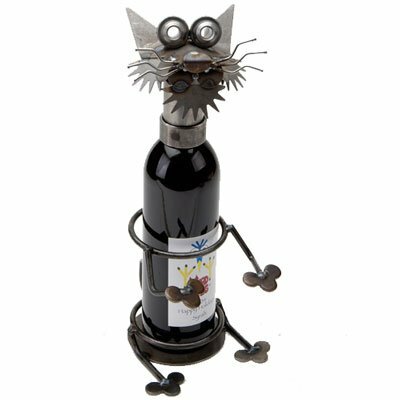 Wine Bottle Holder, Merlot the Cat Bandana Yardbirds Each Yardbird Wine Bottle Holder is created with scrap and recycled parts. Unique & Whimsical they're perfect to hold a bottle of wine, and excellent to give to the person that has everything. Due to the handcrafted nature of these pieces, no two are ever exactly alike. Choose from one of our many designs. Although some designs are special order, we do stock many of them. 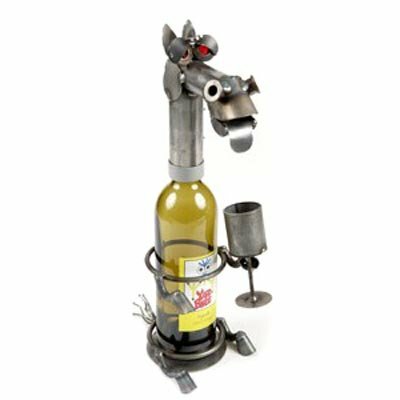 Some of our most popular ones are: Drinking Hound Wine Bottle Holder; measures ~6.5" x 5.5" x 13.2" Horse Wine Bottle Holder; measuers ~7.5" x 5.5" x 15.5" Merlot the Cat Wine Bottle Holder; measures ~6.5" x 6" x 14" Dachshund Wine Bottle Holder; measures ~6.5" x 5.5" x 13.5" German Shepherd Wine Bottle Holder; measures ~6.5" x 5.5" x 16" Terrier Wine Bottle Holder; measures ~6.5" x 5.5" x 15.5" Each Yardbirds Wine Bottle Holder is individually hand made out of recycled steel parts. All of the wineholders are bare metal and will rust with age if not treated. Yardbirds recommends treating them with a clear acrylic enamel spray such as Krylon or Rustoleum. Yardbirds by Richard KolbEach Yardbirds sculpture is created with scrap and recycled parts. Unique & whimsical, they're perfect to decorate your house inside & out. 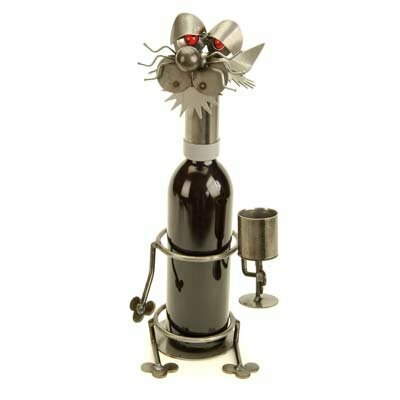 Due to the handcrafted nature of these pieces, no two are ever exactly alike.Junkyard Dogs, Cats, Birds and Sculptures are bare metal and naturally rust with age -- that's their beauty. As we say, "They rust, but they'll never run away." measures 13" x 15" x 23." Each Yardbirds sculpture is individually hand made out of recycled steel parts. Yardbirds recommends treating them with a clear acrylic enamel spray such as Krylon® or Rustoleum® to prevent rusting.Please note: this item will be shipped directly from the artist; no expedited shipping is available. **This is a special order item. 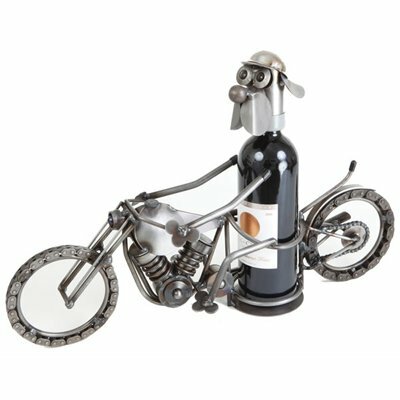 Looking for more Wine Holders Yardbirds similar ideas? Try to explore these searches: Xbox 360 Gamestop, Sheaffers Desk, and Speed Secure Digital Sd Card. 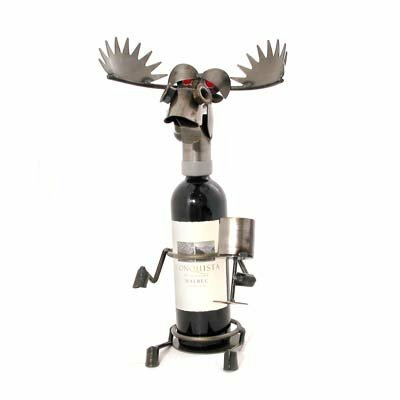 Look at latest related video about Wine Holders Yardbirds. Shopwizion.com is the smartest way for online shopping: compare prices of leading online shops for best deals around the web. 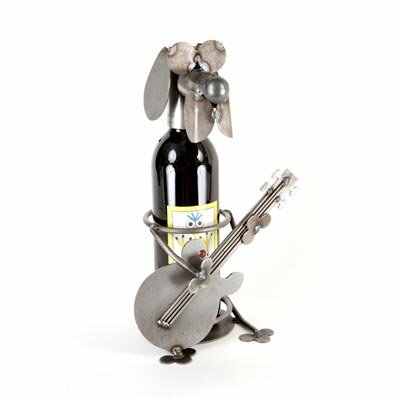 Don't miss TOP Wine Holders Yardbirds deals, updated daily.